Sleep is the universal occupation. We all log some ZZZs each night, and adequate sleep is vital to our health. As important as it is, we’re just not sleeping enough; sleep deprivation has been labeled a public health crisis by practically every notable health organization in the world, from the CDC to the WHO. And, although levels of insomnia have climbed steadily over the past few decades, the number of sleep specialists remains low. OTs could and should be playing a larger role in helping people sleep better. In this article, we lay out the reasons why OT has been underutilized in sleep intervention, and offer some potential ways we can help address this public health crisis. The Canadian Sleep Society lists just 21 accredited sleep medicine providers in all of Canada (which has a population of approximately 36 million), and in the U.S., there are only approximately 2500 accredited sleep centers (for a population of roughly 325 million). Unfortunately, a broad array of groups and lay people are jumping in to meet this need, often providing unevidenced care, which leaves fewer opportunities for accredited health professionals. With a clearer recognition of the scope of the problem, and a touch of extra training, accredited health professions (such as occupational therapists) could step in to fill this gap. By doing so, OTs could make a tremendous positive impact on people’s lives, improve relations between the public and health providers, and do a lot of good for society as a whole. Not to mention create a financially viable win-win situation along the way. Why aren’t OTs more involved in sleep? Looking back over our master-level occupational therapy training, we can’t recall a noteworthy lecture or learning activity regarding sleep. Nor can we find reference to sleep assessment and intervention in any of our educational modules or course syllabi. While this could be an isolated example involving a specific school and educational era (only 4 years ago), it is likely that occupational therapists enter practice with inadequate knowledge to address this important public health concern. Sleep is a complex, multifactorial process that requires some knowledge of biochemistry, neurology, physiology, and psychology (and more). With all of these factors, the barrier to entry into practice can appear high, and feel very intimidating. The good news is we need just a basic understanding of sleep science—and a bit of work to clarify guidelines around sleep intervention—to effectively improve people’s sleep. Many evidence-based sleep interventions already fit within OT scope of practice (such as behavioral-based strategies), and OT models of practice can be effectively applied to sleep problems. Once OTs gain a basic understanding of sleep science, they can then start helping people sleep better. With some experience and that baseline of understanding, therapists can continue to build their knowledge, round out their theories, and go as far down the rabbit hole of sleep science as they want to go! We acknowledge the rabbit hole runs deep; even the experts can’t agree on why we sleep in the first place. As with too much of our practice, there is a lack of OT-specific research on sleep assessment and intervention. A scoping review from 2014 from Leland, et. al. found that, while multiple studies show promise for sleep interventions that fit within an OT scope, none were delivered by actual OTs or as occupational therapy treatments2. While a handful of newer studies, books and opinion pieces have emerged since then (with more undoubtedly in progress at time of this publication), none have investigated the breadth of OT-specific treatment options available3,4,5,6,7. Furthermore, as a profession, we have no best practice or consensus guidelines on OT-specific management of sleep issues. The AOTA has worked hard over the past decade to renew our focus on sleep, and the organization has done a brilliant job of outlining potential roles for us - but only as a position statement. Journals such as AJOT have also been supportive in publishing research on sleep, though much more OT-specific research is needed. Even our Canadian counterpart, CAOT, does not currently have a position statement on sleep. It’s important to note that sleep hygiene sometimes acts as a “catch all” term for several of these strategies, but sleep hygiene is frequently used incorrectly, and research clearly notes that sleep hygiene used in isolation is not effective for addressing sleep issues. Combine sleep hygiene with other CBTi based strategies, though and use skilled OT observation and assessment skills—and you have a recipe for enhancing sleep outcomes. Screenshot of the sleep pattern of one of our team members, taken New Year’s Eve using the Fitbit App. Clearly a fantastic evening... but not great for sleep! One major factor driving new interest around sleep is rapidly advancing technology. Sleep tech primarily consists of sleep-monitoring apps and wearable technologies like Fitbit, which include sleep tracking (actigraphy). These are advancing quickly, and are becoming easier to use, less expensive (or free), and more ubiquitous in the lives of consumers every year. Clients are becoming more informed about their sleep habits (and even some basic science behind sleep) by using these technologies, so it’s important that OTs try out and learn about some of these technologies, in order to be better informed and confident when informing their clients. Consumer-based sleep technologies can be great tools for engaging clients in their own health and self-management. These technologies can even provide valuable information for OTs, in the form of objective data on sleep habits and activity routines. OTs can then integrate this material with subjective self-reports from clients to create a clearer picture of their patients’ sleep patterns and behaviors. This can even help determine which CBTi strategies to use or modify. Once place you can start is by checking out Sleep Time by Azumio. This is an app that runs on both iphone and android, and you can download it for free. Simply place your phone on your bed, and it will track your movement during the night and graph your sleep pattern. Some versions can even track and turn your phone on to record your partner snoring besides you…"I told you so!" What can you do today to help your clients with sleep? Based on the fact that sleep is not a new issue—and OT organizations have had sleep on their radar for decades, but not much has changed from a practical standpoint--it’s unlikely that OT practice around sleep will be improved from the top down. ElevateOT Sleep Webinar: A brand new evidence-based 2.5 hour webinar series all about sleep. It’s specific for OTs, and is designed to upgrade your understanding of sleep science, assessment, and intervention. 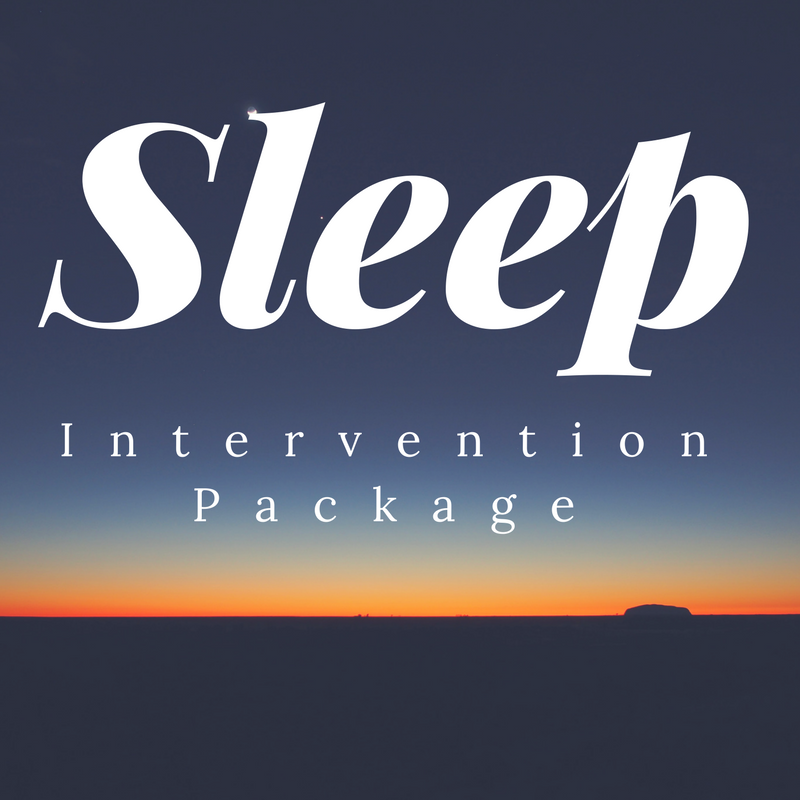 ElevateOT Sleep intervention package: A set of evidence-based forms, handouts, and OT-specific tools to help you effectively address sleep issues in practice today. With a pressing need to address sleep problems and new tools and evidence available, now is the time to awaken your potential to help your clients with sleep. Hopefully, this article has given you concrete tools to explore. If you have any questions If you have any questions, or if you’d like help determining whether any of our resources are the right match for you, feel free to get in touch personally (admin@elevateot.com) and we’ll answer any questions you have. Ford, E. S., Cunningham, T. J., Giles, W. H., & Croft, J. B. (2015). Trends in insomnia and excessive daytime sleepiness among US adults from 2002 to 2012. Sleep medicine, 16(3), 372-378. Faulkner, S., & Mairs, H. (2015). An exploration of the role of the occupational therapist in relation to sleep problems in mental health settings. British Journal of Occupational Therapy, 78(8), 516-524. Ganjikia, S., & Gansor, S. (2015). The Current Status of Occupational Therapy Professionals in Addressing the Occupation of Sleep. American Journal of Occupational Therapy, 69(Supplement_1), 6911510211p1-6911510211p1. Gutman, S. A., Gregory, K. A., Sadlier-Brown, M. M., Schlissel, M. A., Schubert, A. M., Westover, L. A., & Miller, R. C. (2017). Comparative effectiveness of three occupational therapy sleep interventions: A randomized controlled study. OTJR: occupation, participation and health, 37(1), 5-13. Fung, C., Wiseman-Hakes, C., Stergiou-Kita, M., *Nguyen, M., and *Colantonio, A. (2013) ‘Time to wake up: bridging the gap between theory and practice for sleep in occupational therapy.’ British Journal of Occupational Therapy 76, 8, 384–386. Iwama, M., Wilson, S., Durant, C., Alford, C., Hank, D., Hicks, J., ... & Nakopoulou, E. (2015). An Occupational Therapist's Guide to Sleep and Sleep Problems. Jessica Kingsley Publishers.